Spanish La Liga, has it become too uncompetitive? Arguably the biggest match of the Euro 2012 thus far, spectators were treated to the talents of Real Madrid superstars Cristiano Ronaldo, Mesut Ozil, but this time on opposing teams. Other very much notable names include Nani, Pepe, Khedira, Coentrao, Gomez, Podolski, Klose who has had a brilliant record in international competitions just to name a few. Portugal were dumped out of the Euros 4 years ago by Germany, with both of them being finalists in 2004 and 2008 respectively and thus, one can expect a clash of epic proportions; a clash of skill, finesse, defence, goals, pedigree and talent. The Germans were marginal favourites in this one and showed just why by asserting their control over the ball and Gomez well nigh scored off a header in the first minute if not for Rui Patricio. Coentrao then embarked on a destructive run past the entire German defence to win a corner for Portugal. Germany stayed true to the attacking principles that rewarded them with an impressive international reputation over the past decade and ensured that Portugal played without the ball for most of the starting exchanges. Pepe's passes were found wanting as Portugal failed to make any sort of progress on the attack and Postiga was booked for a late challenge on Neuer, though there was an element of theatrics and drama. Ozil looked sharp on the ball, as did Germany on a whole and Portugal had yet to find a way into the game, though Cristiano Ronaldo produced a decent low cross. Germany then pressed far up into Portugal's half and though the ball was rolled into the net by Gomez, the whistle had gone for a foul by Meireles on Khedira with a roar of disapproval from the crowd. The Portuguese defence held strong and Nani came across the German defence to give the ball to Ronaldo, whose shot was closed down by two defenders. Ozil's pass to Podolski was met with a wild volley and Germany continued to attempt, unsuccessfully, to break the resolve of the Portuguese defence. Coentrao stood strong in defence in addition to providing an attacking option, as did Pepe whenever he was called into action. Bruno Alves knocked a cross to safety and later on, Muller missed by a considerable margin. Ozil displayed notable individual ability on the ball, such has been his meteoric growth at the Bernabeu. Nani was fouled by Badstuber and the latter was penalised with a yellow card and the resultant free kick was sent straight down Neuer's throat. Pepe then curled a shot that went off the underside of the bar but barely ever crossed the line. The teams were stalemate at half-time, with Portugal taking comfort in having kept Germany at the gates and Germany visibly flustered by a staunch defensive showing by the Selaccao. Germany kicked us off in the second half and immediately forced Portugal into flurry of blocks, but Portugal made an attack of their own with Nani's quick feet sending him past his marker but it eventually came to nothing. Coentrao then embarked on another mazy run which culminated in a long-range shot by Ronaldo, saved by Neuer. Germany were still clueless in attack and Ronaldo sprinted towards a long ball by Pepe, ignoring Boeteng and sent a cross in which found a rising German header to safety. Ronaldo then sent a ball acrobatically out of his own box, while a dangerous Ozil cross evaded everybody. Germany yet again came knocking at the door, with Ozil yet again terrorising the Portuguese defence with his passing and ball control. Gomez skied his header and Portugal threatened to pull off a Denmark-esque strategy of containment. Coentrao was booked for a reckless foul as Germany consolidated their dominance with wave after wave of attacks. Ronaldo was then sent through by a brilliant pass but was denied by the flailing leg of Jerome Boeteng. Badstuber was perhaps lucky not to have a corner awarded against Germany as he came across to put himself between Nani and the ball. Another testing cross from Muller was snuffed out by Rui Patricio and his long pass into play was well-controlled by Ronaldo, who was fouled by Boeteng. But Germany relentless persistence would soon pay off as Mario Gomez, a Champions League finalist, scored off a header which sent Rui Patricio in the wrong direction to put Germany deservedly in front. All the pressure exerting over much of the 70 minute period soon got its just reward with the header and Germany began to play with an extra spring in their step. Ronaldo then cut inside Boeteng and let rip with a shot which Neuer tipped clear. Portugal then went forward with a limited threat, with Nani eventually clipping the crossbar with a cross. Nani gradually started to pose more and more of a threat to the German backline in a Portuguese retaliation, twisting and turning to find space and fire a poor shot at Neuer's goal. Klose then wriggled his way free of two defenders only for Pepe to come across and put in a typicall robust challenge, but Varela, when faced with a golden opportunity to equalise, could only fire tamely at Neuer. A late Portuguese blitz was quite simply not enough as Bruno Alves' header glanced wide of the goal. Cristiano Ronaldo arguably made the most out of the service he got and couldn't have said to have played badly, as did Nani and company. Paulo Bento's negative tactics was perhaps baffling given the absolute abundance of attacking and defensive talent Portugal boasted, but it was Mario Gomez, possibly one of the best pure goalscorers of the game, whose goal won the day in a match where Portugal's attacking prowess came forth far too late in the game and Germany's youth, versatility and exuberant attacking philosophy shone through in their bid to usurp Spain as European Champions. The World Cup finalists started off the game the better with a star-studded squad including the likes of PFA Footballer of the Year Van Persie, Champions League finalist Robben and Barcelona winger Ibrahim Afellay. The latter looked bright and very much in the mood as he created space with two quickfire stepovers and curled a shot slightly above the bar. Van Persie then curled a testing ball into the box which Sneijder failed to control and direct an attempt on goal. The growing pressure soon told as Denmark's defence looked nervy and unsettled at times. Robben was an constant threat, cutting in from the right flank and then combined well with van Persie to trouble the Danish defence. The pair then continued to prove to be a lethal combination time and time again. Sneijder too, despite a low-key performance, displayed intelligent positioning to hold the Dutch offensive together. Despite all the pressure from the Dutch it was Krohn-Delhi who netted to put the Danes one-up against the run of play with a piece of sublime skill both to deceive the defender and nutmeg the keeper, albeit with an undeniable pinch of fortune. Van Bommel failed to close him down well enough The Netherlands then proceeded to reclaim possession and ping the ball about in search of loopholes in the Danish backline. The 30th minute then saw a good attacking spell from the Danes, but a disastrous pass from Anderson handed the ball right back to Arjen Robben, who jinked about and rattled the post with a shot. Afellay then took on Agger and left him for dead, firing a shot above the target. Denmark, however, continued to grow in stature. Van Persie was then let down by a first touch which afforded Anderson the chance to recover and Sneijder's follow up was wide of the mark. While the Dutch enjoyed a lion's share of possession and shooting chances, they simply couldn't finish them off and Denmark capitalised with a single goal to head into the dressing room one goal to the good. The Dutch upped their tempo at the restart and nearly found a way through, with Robben then yet again coming on on his left to aim a shot narrowly above the crossbar. Van Persie then yet again fluffed his lines, but later producing a decent effort on goal. A thunderous volley from van Bommel was palmed away and Sneijder proved on many occasions to be the scourge of the Danes. Afellay then dragged a shot inches wide while Robben opted to attack from the opposite wing in a Oranje onslaught, which ended in a Heitinga header which beat both keeper and goal. The Danes proceeded to expose their defensive deficiencies, only to provoke a Sneijder-led storm on their goal. Afellay was then stymied by some resolute Danish defending, while they continued to press on on the other end with the goalscorer prompting a brilliant reaction save from Stekelenburg. The ineffectual Christian Eriksen was replaced and Sneijder, imperious as he was tonight channelled a gorgeous through ball to put Klass Jan-Huntelaar on goal, only for Anderson to stand strong against him and later van Persie. A few more chances were fluffed by the Netherlands and while Sneijder continued to thread a variety of good, intelligent passes through the back four, they were unable to make full use of them. Denmark then shored up their defence and convincingly kept the Dutch, for all their neat passing and gusto, at bay. An enraged shout for handball in the 89th minute was waved away by the referee as the Dutch tried to salvage a draw from the match. The frustration was beginning to show on the faces of Sneijder and Robben as they registered their 28th attempt on goal, all of which with no end-product. The Danes then held on to their single goal to ensure one of the biggest upsets of the competition was to be, with the Dutch only left to rue profligate finishing which did their control over the flow of the game absolutely no justice at all. This was a match that featured major characters in European football, with Arshavin and Rosicky notably both having once donned an Arsenal shirt and Cech proving to be Chelsea's saving grace in the Champions League. A quick foul little more than 2 seconds from kick-off added some drama to the match and the Czech Republic wasted little time in seizing the initiative, applying offensive pressure with 2 corners in quick succession. A competent delivery from a set piece saw Hubnik head just wide of the Russian goal and Jiracek produced a spark of brilliance to leave his markers trailing only to fail to produce a good final ball. The Czechs were obviously on the ascendency, with some nifty interplay and prolonged periods of possession pinning the Russians far back into their half. A galloping run from Kadlec followed by a cross was met with a powerful volley and Rosicky launched a shot which was always rising far above the target. Russia's answer to the Czech salvo came in the form of Arshavin, who immediately posed as a thorn in the side of the defence and played an integral part in Russia's goal, taking full advantage of Kadlec's dismal position to produce a cross resulting in a headed deflection which in turn set up Dzagoev to drive the ball home past Petr Cech. The tide consequently swung in favour of the Russians, who then again engaged in a passing move that Dzagoev did no justice to by screwing well wide of the mark. The Czech Republic then pressed further up into Russian territory, with a corner snuffed out by the Russian goalkeeper. On the other hand, however, Russia's attacking flair once again came to the forefront as Arshavin's threaded pass tore the Czech defence wide open for Shirokov to add to Russia's advantage perhaps yet again punishment for Kadlec's sluggish man-marking. Arshavin then had a strong shout for a penalty when he was bundled over by a defender and then left his marker for dead to produce a dangerous pass that none of his teammates were in range to reach. The match then turned into a see-saw affair that swung more in Russia's favour than it did the Czechs, though Jiracek's bursting runs did much to help the Czech cause. Milan Baros nearly got to a header but Russia then again terrorised the back four with a rapidly advancing triumvirate, only for Kerzhakov to send the ball rocketing into the stands. Arshavin looked absolutely imperious tonight for his country, his jinking runs imbued with slick close control combining with his eye for a pass to catalyse fluid attacking combinations. A tame Czech riposte was answered by long periods of Russian monopoly of the ball, with Tomas Rosicky in particular having his influence exponentially reduced by watertight marking from the Russian defence. Cech was placed under unnecessary pressure by his defenders with a risky backpass and Jiracek, at times leading the attack on his own, shot from long range with disappointing results. The difference between the teams thus far would have been Russia being able to translate their superior spells of possession into a final product in the form of two goals and link up with one another well in attack, while the Czech Republic quite simply failing to do so being faced with a well-drilled Russian defence. After the break, Arshavin sent yet another quality ball across the face of the goal which was too out of the range of the forward men. Russia showed no fear of working the ball in tight spaces and this served as the foundation of some fabulous undulating football. However, Pilar's goal, which was wrought with cool composure, was a bolt in the blue of the Russian sunshine as he rounded the keeper to slot the ball home. It sparked an immediate Russian response as Selassie registered a beauty of a volley and Kerzhakov sending at least 4 chances wide of the mark with Arshavin once again at the heart of Russia's attacking. Pavlyuchenko then came on in a sensational performance to supply Dzagoev and in turn turned scorer with an incredible piece of skill to turn the defender inside out and cannon the ball into the top of the net. The game was now officially over as a contest. A brief retaliation from the Czechs ensued but it was too little, too late as Russia, playing some top-class stylish football with star man Dzagoev serving as an effective outlet for the mercurial creativity of Arshavin with a clinical double, all but confirmed their status as potential contenders and dark horses of Euro 2012. Poland versus Greece offered up a interesting clash in styles; Greece fell back on the pragmatic, defence-orientated play that won them the European Championship four years ago, while Poland were daring and adventurous in attack. Lewandowski enjoyed good service from the midfielders and some suicidal defending from Greece, coming inches away from putting Poland ahead after diving to meet a waist-level pass from Piszczek. The crowd was treated to some delightfully crisp passing from Poland and the Greek defence crumbled under pressure, the two of which eventually combining to culminate in a headed goal from Lewandowski in the 17th minute. They immediately looked much more reassured after a slightly scrappy start to the curtain-raiser, with Polanski in particular heavily involved, doing well to keep the Greeks very much uninvolved in proceedings. Chalkias looked vulnerable on a number of occasions and his team's attempt to stifle the waves of Polish attacks was found wanting. A controversial decision by the referee to award Sokratis Papastathopoulos with a yellow card and consequently a red before half-time for two soft challenges added to the tension as Greece saw a rare spell in attack which bore no fruition. The second half, however provided an interesting twist to the tale as the Greeks emerged from their defensive shell and a goalkeeping blunder, perhaps caused by obstruction from one of the defenders, resulted in a virtual open net chance being presented to Dimitris Salpingidis who made no mistake and scored the equaliser in the 51st minute. This immediately provided the impetus for a period of pressure from the Greeks and Celtic attacker Samaras pulled a shot well wide of the goal after a tantalising ball sent through by Katsouranis. The game immediately heated up as Wojciech Szczesny stuck out a foot to impede Salpingiditis, which the referee treated as a straight red card offence. Off went the Arsenal goalkeeper and on stepped the gangly Przemyslaw Tyton in the place of Rybus, who pulled of an absolutely heroic save to deny Karagounis from the penalty spot. Szczesny's reaction in the tunnel was one of much relief while the dejected expression of Fernando Santos told the whole story as Greece continued to attempt to break out of their defensive shell in the face of growing Polish pressure. Salpingditis was then caught offside after tapping home the ball from close range and Samaras sent a wild shot far into the stands. Greece were attacking but were mostly restricted to speculative shots from distance. On the Polish side of things, however, playmaker Obraniak grew more and more involved in dictating the tempo of his side's attacks and after yet another poor attempt from Greece to find the net, Lewandowski latched on to a through ball to volley into the side-netting. Poland's German-based players combined well to produce some flowing attacking moves that the Greek backline frantically threw bodies forth to snuff out. Jakub Blaszczykowski tore down the wing and whipped a good ball in but that was as far as things went. Greece often lacked creativity and ideas in attack but largely held firm in the defensive department, endeavouring to contain Poland and eventually did as the match finished in a 1-1 draw. However, the match was a thoroughly entertaining one, set the tone for Euro 2012 and far exceeded expectations with an unprecedented penalty save from a substitute goalkeeper, some wonderfully exuberant attacking football from Poland which was matched by a display of Greek endeavour. The last few weeks have been wonderful for English teams. Manchester City won this season's English Premier League and in the past weekend Chelsea won the coveted UEFA Champion's League. Both are remarkable achievements but in the midst of their celebrations some people are stating that the teams only won their titles due to previously unheard of sums of money. Is there a chance that small teams can still make an impact in the world of football? A team in Israel's Premier League is proving that there is still romance and hope for smaller teams. On the 2 April 2012, IIroni Kiryat Shmona secured their maiden title win with a 0–0 draw against league giants Hapoel Tel Aviv. Remarkably, IIroni Kiryat Shmona, won the title with five games to go. It is an even bigger achievement when you consider the history of the club. The club has been in existence for 12 years, been promoted, relegated and promoted again through the ranks of Israel's football ranks to ultimately win the country's highest football honor. They are not a small club who has wealthy benefactors, nor are they are hugely followed team whose supporters drive large income streams through the club. They come from a town of 21,000 people and play in a stadium with a maximum capacity of 5,500 fans. A bare minimum squad of 26 has reached the pinnacle of domestic football and will now play in the qualifying stages of the UEFA Champions League. In a city more accustomed to missile attacks as one of the most northern of Israel's cities, Ironi Kiryat Shmona are now making fireworks of their own. Now those fireworks will have the chance to enter Europe's biggest football scene. The biggest of Israel's clubs, Maccabi Haifa FC, Maccabi Tel-Aviv FC, Hapoel Tel Aviv and Beitar Jerusalem FC have been confounded by IIroni Kiryat Shmona's success. 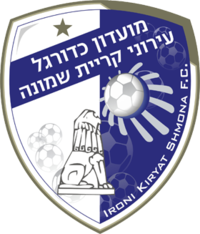 With a dramatically smaller budget, playing group and staff IIroni Kiryat Shmona have become the little club who could. In the club's early days, and perhaps with his tongue firmly planted in his cheek, Hapoel Kiryat Shmona FC owner Izzy Sheratzky suggested, "When I founded the club I said that one day we would reach the Champions League," His light-hearted suggestion is now a dawning reality. Their fans put their success down to one thing, a lack of ego in the squad. A simple but effective ethos that many small clubs would, it could be suggested, be looking to emulate. You're up then you're down, you're in then you're out! One of the the most captivating and endearing traditions of the English Premier League is the final day. The one day of the season where dreams of winning the title or perhaps qualifying for European competitions is mixed with the dread of relegation for some supporters. Hearts beat faster, nails are chewed to the quick and the drama is enhanced with all teams kicking off at the same time meaning that radios are listened to and whispers of other scorelines become a roar. The final day of the 2011/12 season was one for the ages, teams changed positions, titles were won and lost and fans from all over the world were glued to the on field action from their stadium seats, television and computer screens as well as radio broadcasts. Let's look back at four team's fortunes on of the most dramatic final days for many years. At the top of the league it was the battle of Manchester with both teams on the same amount of points but Manchester City holding a decisive +8 goal difference over their rivals. Manchester City 86 points (+63 goal difference) vs Queens Park Rangers at home. Manchester United 86 points (+55 goal difference) vs Sunderland away. At the bottom of the league there was one more relegation spot to avoid and two candidates desperate to avoid the drop. Bolton Wanderers 35 points (-31 goal difference) vs Stoke City away. Queens Park Rangers 37 points (-22 goal difference) vs Manchester City away. 12' Jonathon Walters scores for Stoke against Bolton. Bolton Wanderers 35 points (-32 goal difference) 18th in the relegation spot. Queens Park Rangers 37 points (-22 goal difference) 17th and safe. Manchester City 86 points (+63 goal difference) Nervously atop the league. Manchester United 86 points (+55 goal difference) Pushing for the first goal. 20' Wayne Rooney scores for Manchester United. Manchester City 86 points (+63 goal difference) Their crowds bays for a goal as word gets around that United are leading Sunderland. Manchester United 89 points (+56 goal difference) The hope of a 20th title is 70m minutes away. 39' Mark Davies scores for Bolton and Pablo Zabaleta scores for Manchester City. Bolton Wanderers 36 points (-31 goal difference) 18th in the relegation spot but a chance to win and climb to safety. Queens Park Rangers 37 points (-23 goal difference) 17th and still safe at this stage. Hoping for a Stoke win and/or equaliser against Manchester City. Manchester City 89 points (+64 goal difference) City regains the league lead. Manchester United 89 points (+56 goal difference) United concentrate on their own slim lead knowing that they must at least win their own game first. 45' Kevin Davies fires Bolton into the lead against Stoke. Bolton Wanderers 38 points (-30 goal difference) 17th and the great escape music and chants resonate at half-time. Queens Park Rangers 37 points (-23 goal difference) Half-time is a time of despair, away to Manchester City and still hoping for their own team or Stoke to revive their hopes. Manchester City 89 points (+64 goal difference) City maintains the league lead. Manchester United 89 points (+56 goal difference) United hold a slender half-time lead. 51' Cisse scores for Queens Park Rangers. Bolton Wanderers 38 points (-30 goal difference) 17th with a point lead over QPR. Queens Park Rangers 37 points (-22 goal difference) 18th and a chance to keep their fate in their own hands. Manchester City 87 points (+63 goal difference) City have a fight on their hands as the 44 year drought hangs over the heads of the City faithful. Manchester United 89 points (+56 goal difference) United cannot believe they can still win the league. 55' Joey Barton's brain fade and straight red leaves QPR down to 10 men. 66' Jamie Mackie's header puts QPR into the lead against Manchester City! Queens Park Rangers 40 points (-21 goal difference) 17th and not needing to keep an eye or ear on the Bolton match. Manchester City 86 points (+62 goal difference) City fans memories of past failures are now prominent. Manchester United 89 points (+56 goal difference) United now have one hand on the trophy. 77' Jonathon Walters converts a penalty to equalise for Stoke. Bolton Wanderers 36 points (-31 goal difference) 18th and back where they started at the beginning of play. Manchester City 86 points (+62 goal difference) City fans memories of past failures are still prominent. Manchester United 89 points (+56 goal difference) United now have one hand on the trophy and are listening to the result at the Etihad stadium. Stoke City 2 v Bolton Wanderers 2 Bolton are relegated, Queens Park Rangers are safe. Sunderland 0 v Manchester United 1 United are champions unless City can conjure two late miracle goals deep into extra time. 92' Dzeko scores from a point blank header to give desperate City fans the cruelest slivers of hope. Manchester City 87 points (+63 goal difference) City fans can barely watch, urging their team for one last effort as the title slips away with every second. Manchester United 89 points (+56 goal difference) United fans world-wide are praying for a final whistle to blow at the Etihad stadium. 94' The son-in-law of one of the world's greatest ever players drifts into the right side of the penalty box and rifles a shot across Kenny's outstretched right hand and with less than a minute to go Manchester City are the Champions of the English Premier League! Bolton Wanderers 36 points (-31 goal difference) 18th and relegated. They were safe and then relegated in a roller coaster and ultimately disappointing afternoon. Queens Park Rangers 37 points (-23 goal difference) Relegated, and then beating the Champions in waiting, ending in a defeat but more importantly Stoke's equaliser kept them in the premiership. Manchester City 89 points (+64 goal difference) City fans will celebrate for years to come in an afternoon that would have damaged many of their hearts, nails and bleeding lips. Manchester United 89 points (+56 goal difference) United and Ferguson fought to the end but now have to wait at least one more season for the historic 20th title. What a day! A day that could not have been scripted with much more drama in mind! The kind of day that sums up every feeling that the wonderful game of football evokes. Congratulations to the new English Premiership League winners, Manchester City! Aston Villa's season of woe is not a one season travesty! Aston Villa look likely to stay in the EPL for next season after a barely deserved draw against a ten man Tottenham team with other results also going their way. Unless the unlikely happens, Aston Villa losing and Bolton winning next weekend's game whilst making up a 17 goal differential the Birmingham based club will retain their premiership status. What has gone wrong for one of England's bigger teams? Could financial security could be one of the major factors in the fall of Aston Villa? McLeish looking up the ladder. Aston Villa have not won a title since the dawn of the Premier League but they have come close on one occasion and flirted with the top five for more years than they have flirted with relegation. Their support is solid and they have seen a plethora of talented players, Gareth Barry and Ashley Young to name two, progress to bigger and more successful organisations. In therein lies the true standing of Aston Villa, this generations feeder club to the likes of the Manchester giants. In early June 2011, Aston Villa appointed manager Alex McLeish from newly relegated and bitter rivals Birmingham City after unsuccessfully seeking the services of Wigan Athletic's Roberto Martinez. It would be easy to easy to lay the blame of Aston Villa's horror season solely on the manager instead of the owners, after all Martinez's Wigan are only two points above the struggling Villa team. Martinez's decision may have had a two fold benefit; he is seen as loyal for staying at Wigan whilst appearing to be pre-cognitive in his decision not to take the helm at Villa. The rationale of signing McLeish has not been espoused but would appear to be based on monetary factors; firstly that the club could afford him, secondly that he could afford to accept the restrictions that have been placed upon him by the owners of the club. Aston Villa is a selling club, its flirtation with the higher echelons of the Premiership have become jealous mutterings. Yes, injuries have played a significant part in the demise of Villa's season but they paint over the significant cracks of a lack of funds, a squad that is far too short to survive the rigors of a torrid and physical English Premiership League season. This has been evident for several seasons with Aston Villa falling away significantly after the Christmas periods. This will not likely change as Aston Villa's American owner, Randy Lerner, owns clubs that lose a minimum of money whilst making little impact on the competitions that they inhabit. In his ten year ownership of the Cleveland Browns, since inheriting the team from his father, they have barely reached a 40% win rate in a competition that has both a salary cap and draft concessions for badly performing teams. Perhaps it is the expectations of Aston Villa supporters that need to be lowered, survival in the English Premier League with it's multi-national and diverse owners is becoming harder every year. The disparity between the league's haves and have-nots is already creating a three tier competition. A competition composed of those seeking the title and at least European qualification, the middle tier satisfied with the benefits of playing in the Premier League and the third tier whose yo-yo'ing between competitions is a scary and more likely reality. Perhaps mediocrity in the premiership is looking more acceptable every day as opposed to falling down the English leagues and the monetary issues that ensue. A good run in the FA Cup against the big boys of the premiership may one day appease a supporter group that has got use to being one of the bigger English clubs. The last few seasons have given even the most optimistic supporters to the way ahead for Aston Villa, and it is more than likely not to be found at the moment by looking up. He has had a season of footballing hell, and I am sure that no one expected him to have the week that he has but dare we say it, Fernando Torres appears back on track. The former darling of Liverpool must surely be starting to win the hearts of Chelsea fans after scoring the sealing goal in the Champions League Semi-final against Barcelona mid-week. He maintained the fury over the weekend with a superb hatrick in the local derby versus strugglers Queens Park Rangers in Chelsea's 6-1 win. Worth every cent I hear some Chelsea fans say! Honorable mention: Barcelona's resounding response to their Champion's League elimination, thrashing Rayo Vallecano 7-0 away at the Campo de Fútbol de Vallecas. Tottenham Hotspurs were 11 points clear of fourth position, comfortably ensconced in the automatic Champion's League spot and then Harrygate took place. The manager of Tottenham, Harry Redknapp, faced court on charges of taxation fraud in which he was found innocent. If this was not enough of a distraction he was then linked, and continues to be, with the vacant England Manager role. Evidence of the distraction was Tottenham's one win out of their last nine since the speculation. Now Mr Redknapp has received bad news with rising speculation that Roy Hodsgon may be edging him for the coveted England role. Luckily for Tottenham, even with the bad run, they won against Blackburn two nil over the weekend keeping their diminishing Champion's League hopes alive. Bad news: Aston Villa are now well and truly in the relegation mud heap, casting doubts on Brett Holman's scheduled summer transfer. They have been the perennial pin up boys of Asian football, but like every team at one point Japan's Gamba Osaka are rebuilding and the act of rebuilding has seen the team fall to unprecedented lows this season. The latest round of the J-League highlighted Gamba Osaka's plight as they were crushed five nil away to Kashima Antlers. One of the conceded goals is as funny as any of the zany Japanese game shows that are favored in Japan! Gamba Osaka are currently sitting in the relegation zone after eight matches, even this early in the season the alarm bells must be ringing. What are your thoughts? What were your weekend's Good, the Bad and the Downright ugly?